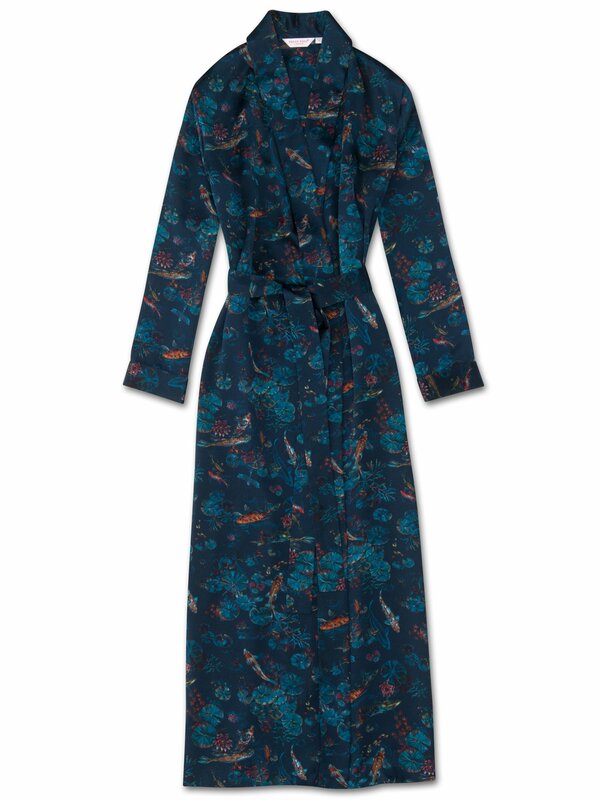 The Brindisi 28 silk full length dressing gown features a stunning hand-drawn print that utilises a dark navy background to offset the colourful, inky illustrations of koi carp swimming amongst the lily pads - traditionally a symbol of luck and prosperity in Japan. Handmade in our workshop in Cheshire, England, this beautiful floor length dressing gown is crafted from luxurious pure silk that has been digitally printed in Italy. We cut the Brindisi 28 fabric by hand to ensure we uphold the supremely soft and smooth satin finish and then it's sewn together in extremely limited quantities by our skilled seamstresses. Designed for a relaxed but flattering and elegant shape, our women's dressing gowns will keep you looking great and feeling comfortable throughout the seasons. Just like our shorter versions, the full length style has two hidden side-seam pockets and a self-fabric kimono style collar, cuffs and waist-tie for an effortlessly stylish finish.